Nothing says “Good Morning” like a freshly cooked warm bowl of oatmeal. So besides the traditional way of consuming oatmeal, I’m going to share with you 4 delicious and easy ways to add oats into your breakfast. Breakfast is the most important meal of the day. 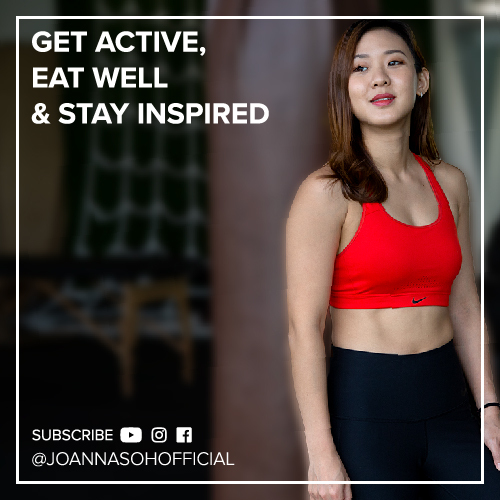 Having a healthy hearty breakfast gets my metabolism pumping, keeps my energized and it really does benefit me in making healthier choices throughout the day. Whether slow cooked and creamy, blended with fresh fruit in a smoothie or added into energy bars, oats provide your body with many benefits. For men you should be getting between 30 to 38 grams of fiber a day and between 21 to 25 grams of fiber for ladies. One cup of cooked oatmeal contains 150 Calories, 5g of fiber and 7g of protein. The unique fiber in oatmeal called beta-glucan has been proven to lower your LDL or bad cholesterol levels without affecting the HDL or good cholesterol. 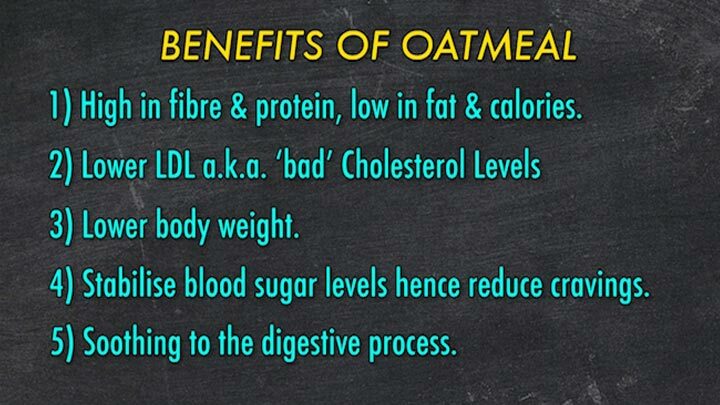 Oatmeal is a great source of fiber. Hence having oats for breakfast will keep up full for much longer, which means eating less throughout the day. A bowl of oatmeal can easily last you till lunch without feeling peckish. A high fiber diet will also stabilize blood sugar levels, providing you with a steady release of energy throughout the day and won’t cause the mid-morning slumps. 5) Soothing to the digestive process. Unlike a heavy breakfast high in sugar and fat, which may leave you feeling bloated and sluggish, oats are very soothing to tummy. It’s filling, yet light and keeps your tummy happy. If you’re someone who rush out of bed, dash out of the front door and have no time to make breakfast, well why not prep your breakfast the night before. If you fail to plan, well you plan to fail. So no matter how busy you are, just take a little bit of initiative and prep ahead. I like to call this the “Sloppy” Overnight Oatmeal because it’s so easy, it only takes 5 minutes to prep and there’s absolutely no cooking required at all. 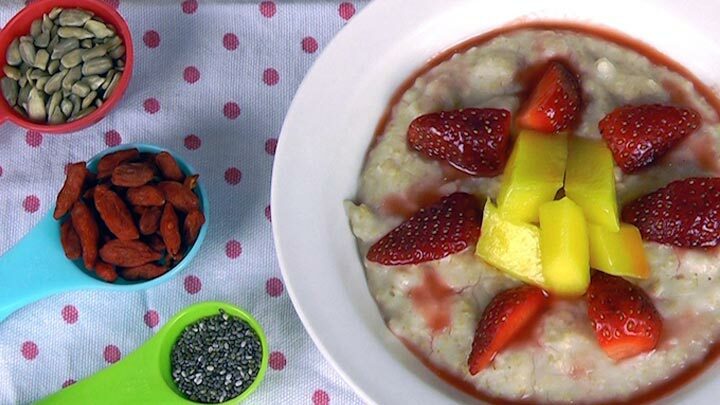 1) In a bowl, mix oats, milk, goji berries and chia seeds together. 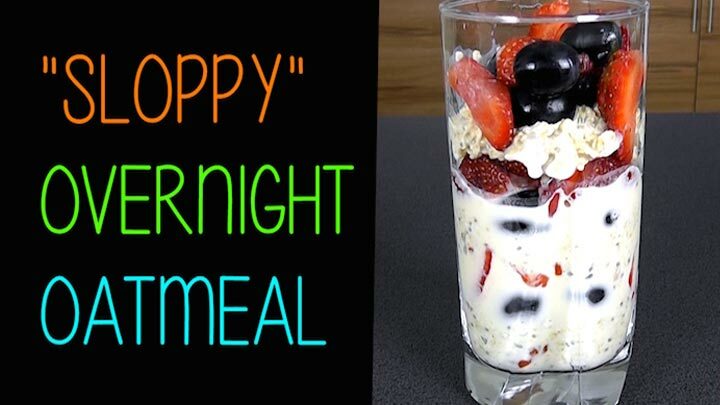 2) Now let’s assemble the Sloppy Overnight Oatmeal’, either in a jar or glass. 3) Lay the bottom with half of the oat mixture, then add in half of the fruits, strawberries and grapes and mix in the remining oat mixture. Finally top it up with the remaining fruits. 4) Place this colourful jar in the fridge overnight and serve it for breakfast the next morning. The chia seeds will add a thick and creamy texture, and the natural sweetness from the fruits will sip into the oat mixture which gives it a really sweet taste without any added sugar. This sloppy looking breakfast is so yummy and will keep you full till lunch-time! You can even make several jars and keep them in the fridge for the next few mornings, but no longer than 3 days before eating. Be creative, pick your fruits and mix the ingredients up to have varieties. So busy people, you have no excuse! 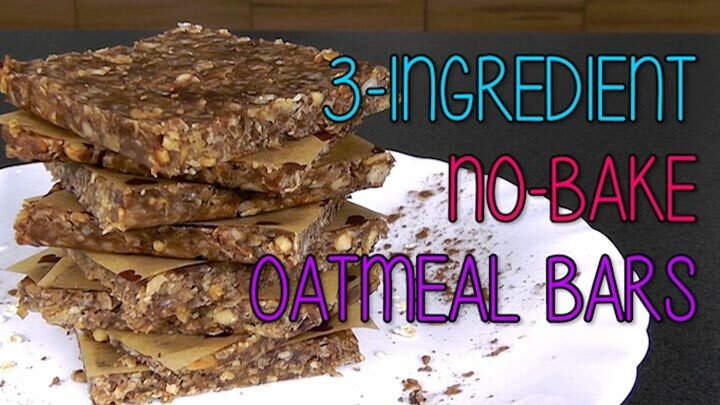 The next Oatmeal breakfast can also double up as an energy bar. If you’ve been following me on my social media pages, you’ll know that this is one of my favourite snacks. They are so yummy that I have to control myself from eating all of them at once! You only need 3 basic ingredients and no baking is required. 1) In a pan, melt the peanut butter and maple syrup together under low heat until smooth. Don’t cook! 2) Turn the heat off. Then add in the oats, cocoa powder and sunflower seeds. Combine well. 3) Transfer and press mixture into a medium square tin. Then place it in the refrigerator for about an hour or more until firmed. 4) Finally, slice the oat mixture into 9 squares. Having just 2 oat squares provide you with 340Cals, 8g of fiber and 12.6g of protein. These healthy oaty squares with sunflower seeds are easy to be eaten and will give you an energy boost throughout the day! Store in the fridge to keep them firm and these will last up to a week. 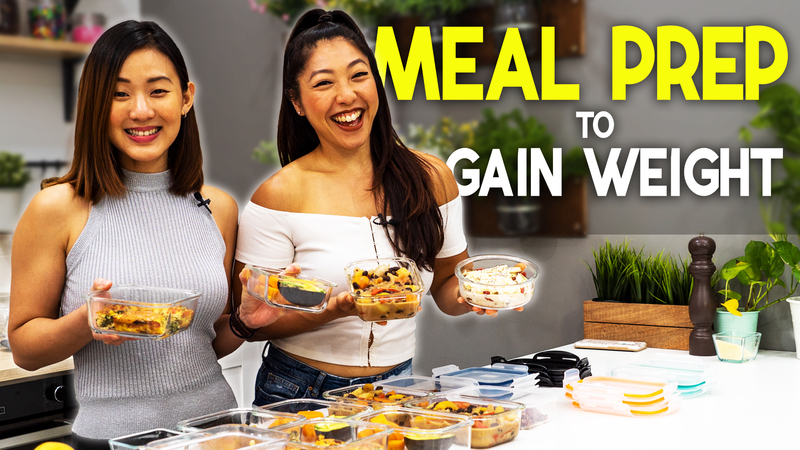 You can pack them out, have them on the way to work, or even as a mid afternoon snack if you ever need a quick energy boost. Another great way to add oats into your diet is to add them into smoothies. Smoothies make a really quick, refreshing and filling breakfast too. Be sure to watch my videos here to make a perfect green smoothie as well as fruit smoothie. Once you know the basic steps to make delicious smoothies, you can keep experimenting with different fruits or toppings and you’ll never drink the same flavor of smoothie again. 1) To get a nice consistent texture, start by blending the oats until finely ground. 2) Then add the remaining ingredients; frozen banana, mango and coconut water. 3) Pulse until blended and smooth. Viola, breakfast is served! 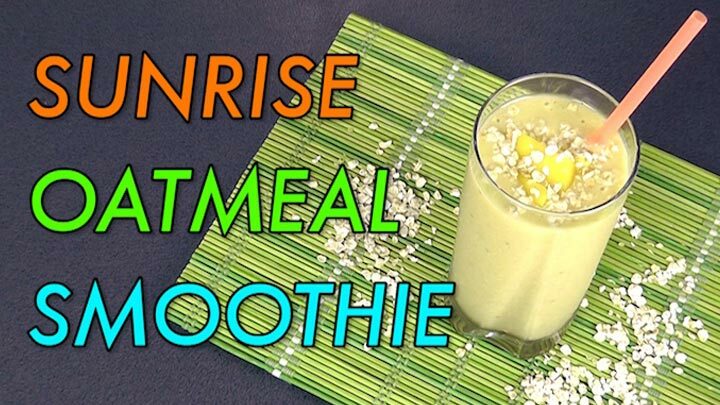 This delicious glass of Sunrise Oatmeal smoothie is packed with fiber and flavor. It fills you up, yet at the same time it doesn’t leave you feeling heavy or bloated in the morning. So if you’re not really a breakfast type of person or if you prefer to drink your breakfast, have smoothies in the morning and be sure to add oats to gain the health benefits. 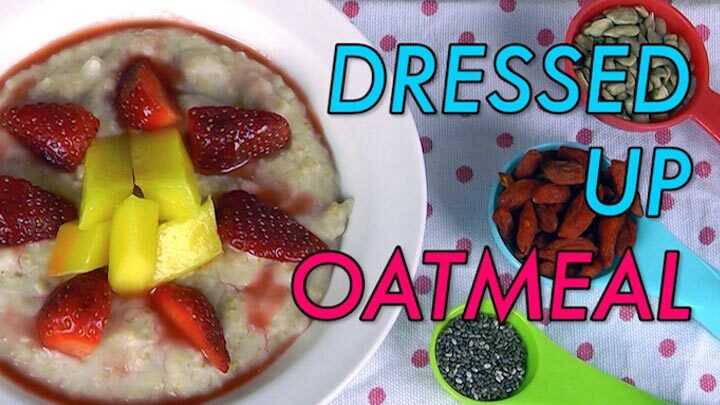 And of course the most common way to have oats is a freshly cooked warm bowl of oatmeal. If you think it’s bland and tasteless, well you haven’t taken it a step further and experiment with your oatmeal. This is your bowl, you can literally add anything. For instance a mixture of fresh fruits, trail of dried fruits and nuts, jam, peanut butter, sweeten it with honey or maple syrup, make it chocolaty with cocoa powder, add protein powder, or make it savory by adding an egg or turn it into a congee by cooking it with fish slices or even chicken. Basically, whatever it is you like, you can add it into your oatmeal. So be adventures and try different toppings. Give oats a chance, and I can assure you, you’ll be hooked to it in no time.